We recently finished our basement bathroom renovation (last Thursday, to be exact), just two days before V's 1st Birthday Party. The demo began in the end of March with the actual renovation starting in the beginning of April and we didn't work on it every day, but overall it was completed in about 8 weeks. Dustin is a Master Licensed Plumber so he did a lot of it himself. 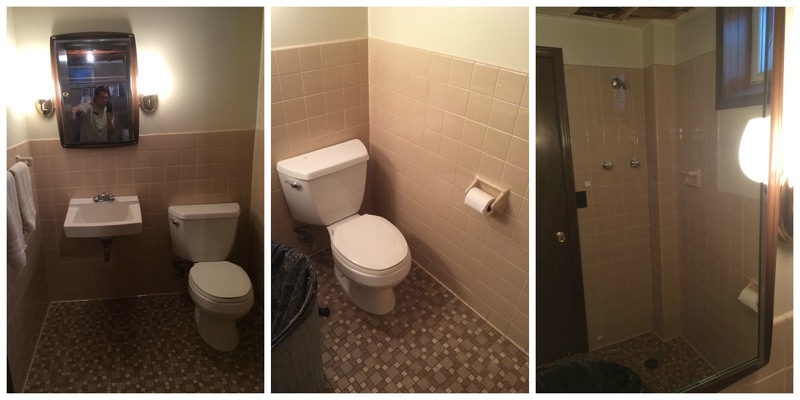 We hired out some of the work to our regular contractor [who helped us remodel our entire basement last year], as well as our electrician & tiler. It's so great that Dustin works in the construction business because not only is he able to purchase everything wholesale [which equals a huge savings], access all the necessary tools without having to buy them [more savings], and knows all the right people for the job, but he is an amazing plumber who can figure out just about anything! Thank goodness, because if it were left up to me, we would have been in trouble. I didn't even know the hot water is always on the left until I started dating him back in 2008! [Yes, true story]. 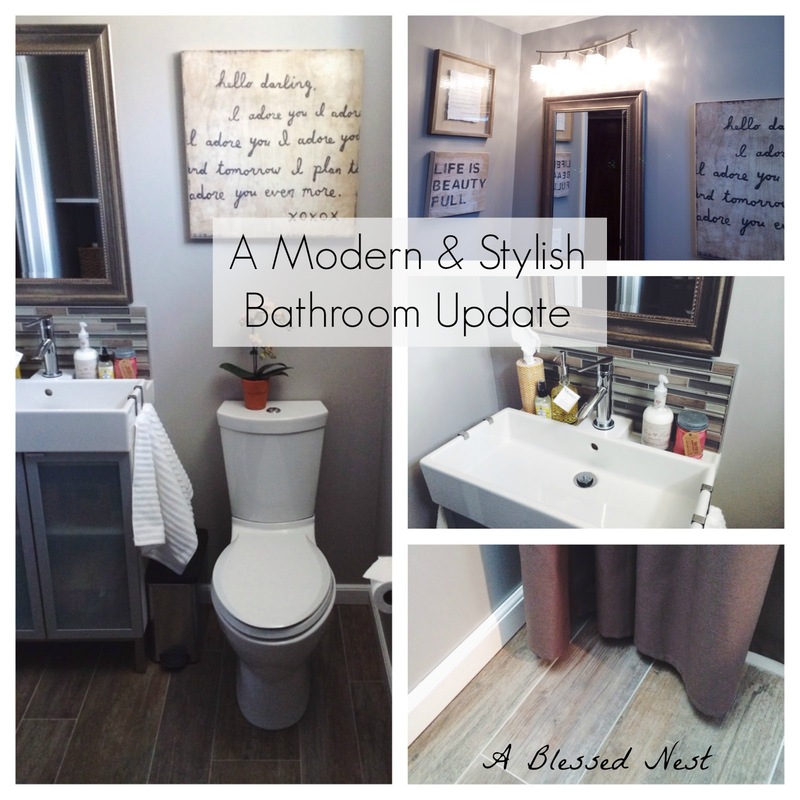 So it goes without saying that I am thrilled to share our new bathroom makeover today on the blog. It is more beautiful than I could have ever dreamed of, and sometimes when I am in the basement playing with Olivia, I just stand in it and admire all the hard work that my husband put into it. Not only will we be able to enjoy it as we live here, but I know it will add tremendous value to our home when we are ready to sell. Thats a win-win in my book. Our house was built in the 1950s, so everything in our basement bathroom [when we moved in] was original. Some of its features included pink tile, a shower head located directly above an outlet [what?] and a quite gaudy faux wood mirror with flanking light fixtures. Oh, and spiders. We chose a light gray for our walls because (1) Gray is my favorite color and (2) We knew it would look great with any decor, flooring or fixtures because of its neutrality. Oh and (3) gray really is the new black. We went with a rustic wood tile floor that is seriously so gorgeous it cannot even be captured in a photograph. It even has the knots of real wood in it and because of that, the neatest texture. 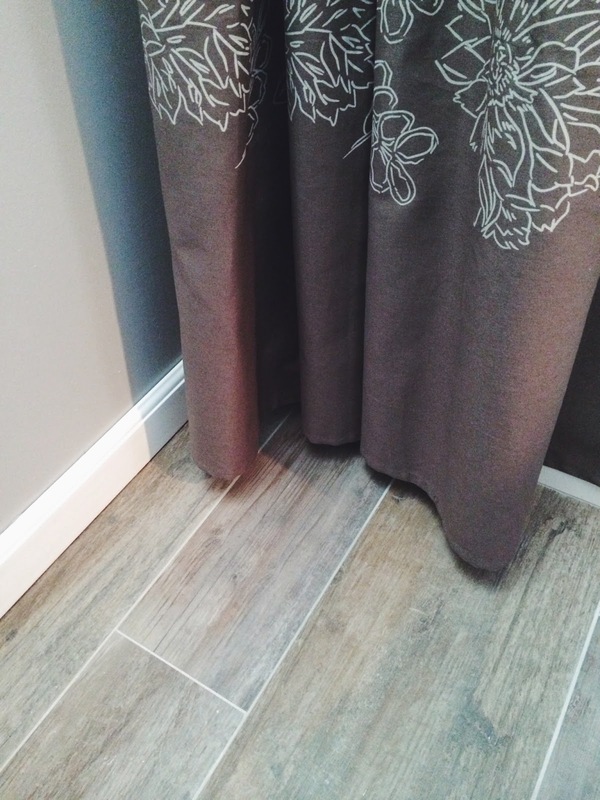 It is by far my favorite flooring in our entire house and I've already got plans to incorporate that into our upstairs master bath & our next home! We chose large gray tile for the shower and I love how well it matches with our wall color and flooring. Another favorite feature of mine? The shower is huge! 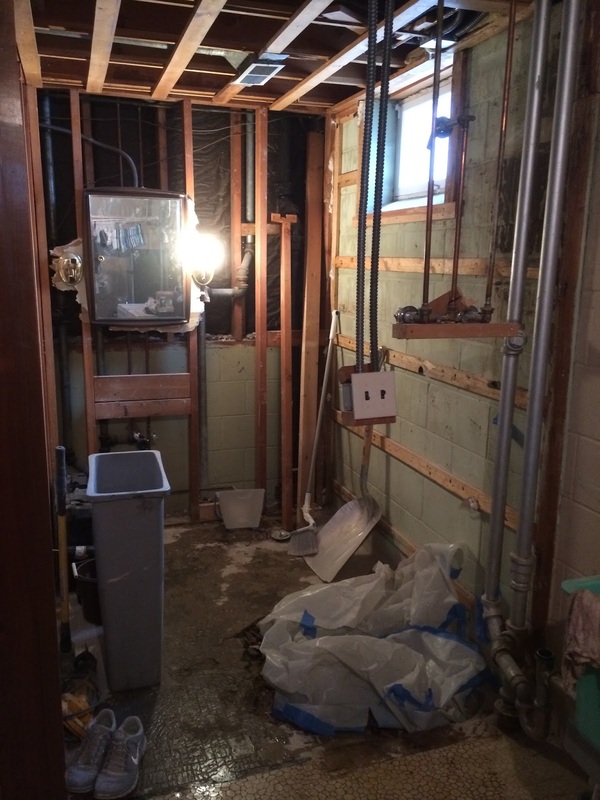 We ended up knocking down the entire back wall [see below] and extending it into our laundry room to make a larger shower and add shelving for storage [oh yeah, did I mention we are renovating our laundry room as well?]. I love how spacious the shower is and how clean and classy the tile is. To the right of the shower, our contractor added in four custom shelves that I will use to store towels, baskets, and other toiletries. The width is 18 inches between each shelf so I can fit a standard laundry basket on each if needed. And that seriously makes me totally giddy. 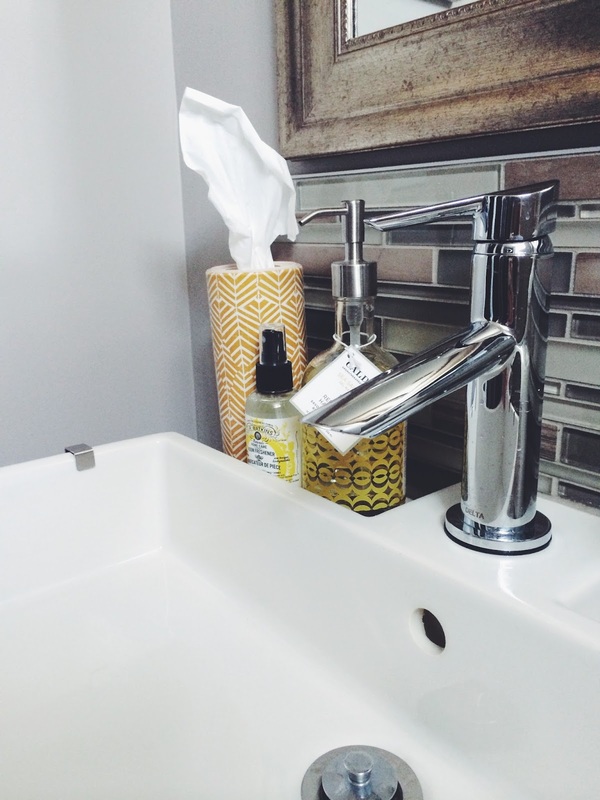 Our vanity is from IKEA and I loved how sleek and modern it is, especially paired with our faucet. 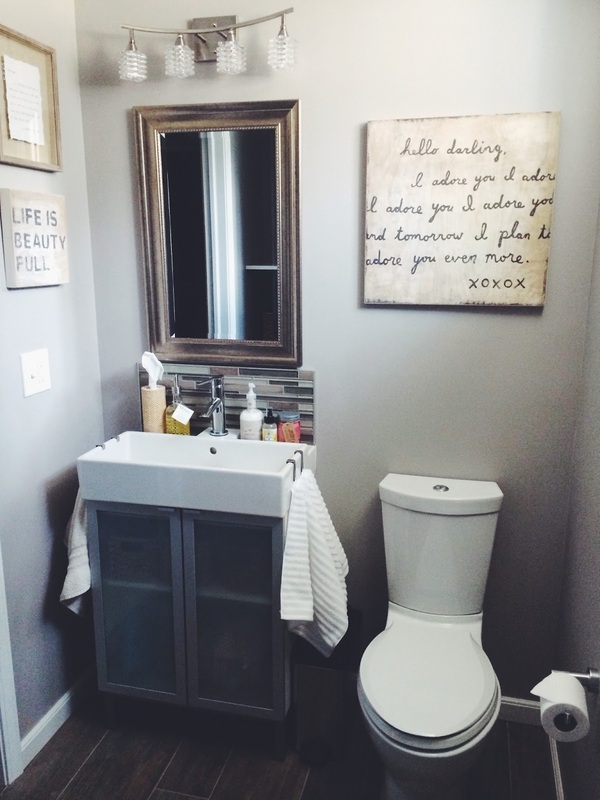 It has plenty of room for storage beneath without taking up a lot of space, which is important in a small bathroom. It has metal hooks on each side [that can be moved as needed or taken off] for hanging hand towels, and it came with other accessories for soap/toiletries/etc. I also love the deep groves in the back that provide the perfect place for hand soap, lotion, a candle & tissue. Our vanity backsplash is multi-colored glass that we felt matched our color scheme perfectly. I think a simple backsplash adds so much elegance and richness to a space and really elevates the quality of the room. Our chrome fixtures are from Ferguson and matched the modern, sleek & "minimalism" aesthetic I was hoping to capture. Our toilet is also from Ferguson and captures the same minimalistic feel because of its thin design. It also has a slow close lid & is water efficient with dual flushes. That also makes me totally giddy. Our light fixture -- possibly my favorite part of the entire room -- is from a local lighting shop where we had purchased Olivia's nursery chandelier. We found it online and because it was out of stock in store, had it custom ordered and two weeks later, it showed up on our doorstep! Because we really save money by doing it all ourselves and purchasing everything at wholesale prices, we tend to splurge on light fixtures in our home. The light is always the final piece we install and once that is in, it is a sign that the room is complete! A really simple way to upgrade a room is to upgrade your light fixture. Even if you don't change anything else, a new light makes such a difference. The art -- my other favorite part of the room -- is all by Sugarboo Designs, based out of Roswell, GA. I fell in love with Sugarboo Designs a few months ago and couldn't wait to get a few pieces in our new bathroom. They are rustic and fit the style of the room perfectly, with the sweetest messages. 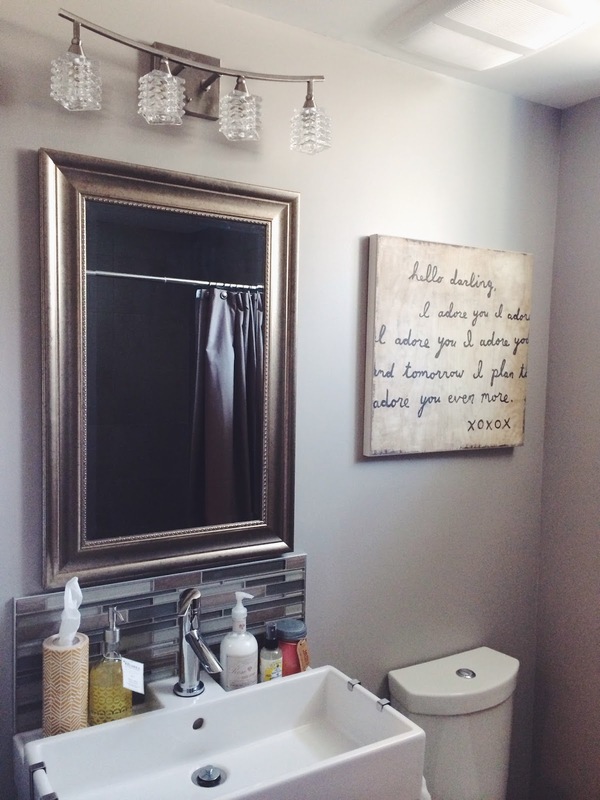 The mirror is from HomeGoods & was an awesome find at a super great price. Overall, though it was a long and somewhat stressful process [as renovations usually are], we are so pleased with how it turned out. Every time I walk into the bathroom, I am filled with joy head to toe. 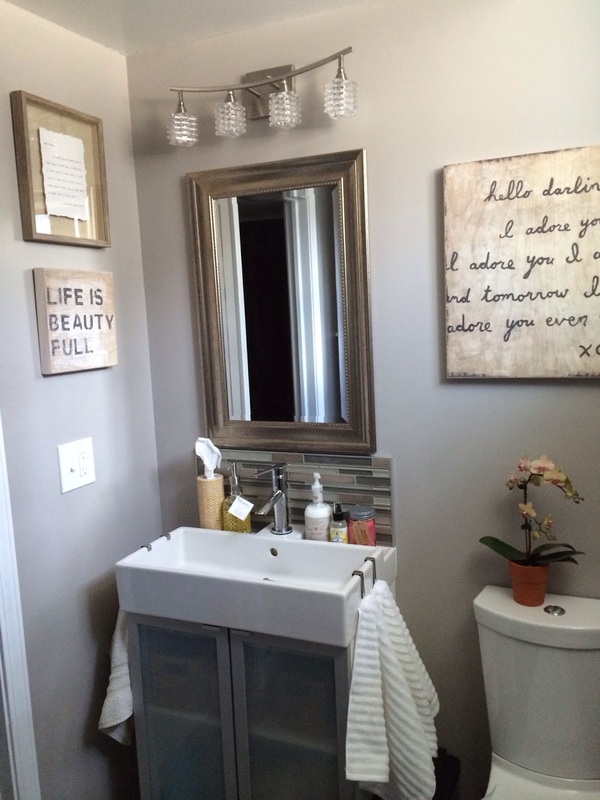 And yes, it is just a bathroom, but shouldn't every room in your house bring you joy? It reminds me of the love that Dustin has for me, for our family, and for our home -- to work all day at his plumbing job and then come home and work all afternoon and evening plumbing and renovating at home, continually exerting himself day after day and giving it his all. It reminds me that we are blessed to live in such a beautiful home and to enjoy every moment I spend in it, because it is a luxury many go without. 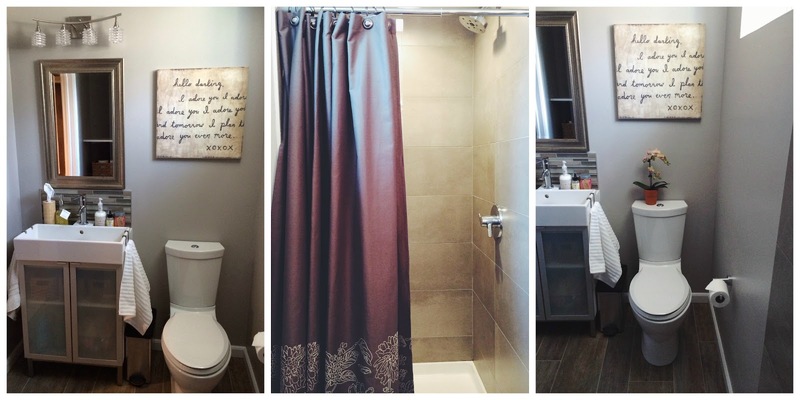 Our new bathroom has added just the right amount of style, beauty & function to our home and I couldn't be more ecstatic!